The goal of any loudspeaker designer is to mimic the experience of live music as closely as possible. As anyone who enjoys live music, and who also enjoys listening to music through loudspeakers, will attest: This is a pretty lofty goal. One of the reasons it's difficult to achieve "lifelike dispersion," is because natural sound, like live music produced on a piano, travels in all directions. Different parts of it reach our ears from different places at different times. 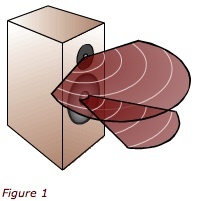 But a loudspeaker usually produces sound using aimed drivers, pointed in one direction or the other. Our ears can tell when sound is natural, coming from all around us, and when it is produced by a stationary, aimed source like a loudspeaker. Most high-frequency and bass/midrange drive units deliver good dispersion patterns at the lower limits of their frequency range. But they naturally begin to "beam" as they reach their upper-frequency limits. This is what constricts dispersion, causing that false sense of aimed sound. 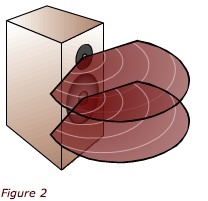 This can be exacerbated by poor speaker placement, causing sound to become unbalanced, dull, or harsh. To achieve the most lifelike dispersion pattern possible in a loudspeaker, Paradigm engineers use a combination of exclusive, innovative electronic and design solutions. The most effective way to improve dispersion patterns is to manipulate the frequency limits, or crossover slopes, between a speaker's high-frequency and bass/midrange drivers. Paradigm engineers use proprietary crossover slope designs that reduce midrange beaming by lowering the crossover frequency. The high-frequency driver’s lower range will then provide wider dispersion, and the bass/midrange driver's output can be rolled off before its dispersion narrows. This has proven to be a very effective approach. Paradigm speakers produce characteristically wide dispersion patterns, while still delivering precise high-frequency details. This kind of performance requires the use of a high-frequency drivers that can handle the vast amounts of power it takes to reproduce these frequencies. That's why Paradigm uses the highest quality tweeter cone and dome materials, and the most exacting tweeter craftsmanship. One of our most advanced designs appears in the flagship Persona line, where both tweeter and midrange drivers use exclusive Beryllium foil material, capable of easily handling the kind of power they need to deliver well-blended, utterly lifelike, room-filling dispersion. Throughout the Paradigm speaker model line, you will find the highest quality materials, reinforced by the most advanced electronic technology, to achieve every speaker designer's goal: Lifelike dispersion.